The Saudi Air Force is headquartered at Riyadh. Like the Army, it has a modern headquarters staff with five major branches: G1, G2, G3 or GS, G4 and G5. The RSAF also has a military academy and an extensive system of training schools and support facilities. Its operational command is structured around its Air Command and Operations Center and base operations. The main Air Command and Operations Center is near Riyadh and there are Sector Operating Centers at Tabuk, Khamis Mushayt, Riyadh, Dhahran, and Al Kharj (Prince Sultan Air Base – PSAB). These centers control air defense operations by fighter aircraft, surface to air missiles and air defense artillery. The Royal Saudi Air Force [RSAF] was established in 1950 during the reign of Abd al Aziz. Its early air operations had been under control of the army. In its initial years, the air force was influenced chiefly by the British, who provided aircraft and advisers and helped train Saudi pilots and maintenance personnel in the kingdom and in Britain. United States influence, emanating from the air base at Dhahran that was leased by the United States from 1952 to 1962, was also pivotal to the early development of the Saudi air force. Some United States aircraft were transferred to the RSAF from units operating at Dhahran and the United States Military Training Mission at Dhahran trained Saudi pilots and maintenance personnel. The RSAF attracted to its ranks young officers who had been educated in the West and favored modernization. Their outlook made them critical of the practice, prevalent since the 1950s, of promotion to the highest ranks of military service on the basis of nepotism and corruption. These attitudes overlapped with ideas propounded by radical and secular Arab nationalists in Yemen, Iraq, and Syria who opposed the Saudi monarchy. In the late 1960s, small dissident groups formed within the Air Force, largely focused on discontent over the pace of modernization, the poor quality of middle management, and the corruption and nepotism that they encountered. In May 1969, the Saudi government cracked down on dissent throughout the kingdom. By September, the government had arrested more than one hundred thirty members of the Saudi military. From late November to mid-December 1969, just as the arrests slackened, Saudi Arabia experienced one of its periodic border clashes with the People’s Democratic Republic of Yemen. South Yemeni forces crossed the border and quickly captured a small post defended by a few Bedouins. The Saudi Air Force counterattacked, supported by British military advisers, and helped drive the invading forces out of the country. The loyal and effective performance by the RSAF helped restore its relationship with the Saudi ruling elite, leading the monarchy to coopt rather than persecute the dissident elements. The royal family accelerated the pace of the Air Force’s modernization, shifted promotion to merit rather than ethnic or tribal background, committed to reducing corruption and nepotism, and expanded improvements in living conditions for members of the military. In the 1960s, Saudi Arabia had purchased British aircraft and equipment; in the 1970s, it chose to buy American planes. In June 1971, using Foreign Military Sales (FMS) procedures, the Saudi government bought one hundred F–5 fighter aircraft, to be delivered over several years, at a cost of $130 million. In late February 1972, the U.S. Air Force Logistics Command (AFLC), acting as project manager, signed a memorandum of understanding with the Corps of Engineers to provide budgetary and technical reviews of the criteria, schedules, spending, and engineering and design specifications for the program called Peace Hawk. In May, the AFLC awarded a letter contract with the manufacturer of the F–5, Northrop Corporation, to build facilities, train Saudi Air Force personnel, and maintain the aircraft. 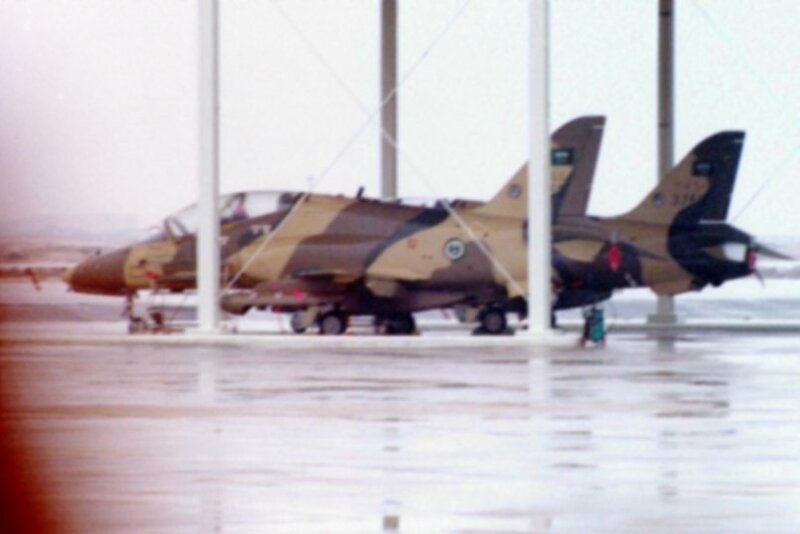 Through the Peace Hawk program, the Royal Saudi Air Force received F–5 aircraft and the facilities to support them. The U.S. Air Force, not the Corps of Engineers, managed the program from design through construction, with the Corps providing only limited service by reviewing budgetary issues, technical criteria, and engineering design and specifications and by inspecting and supervising construction of facilities at Dhahran and Taif. In 1972 the first of 114 Northrop F-5s were delivered to the RSAF. Starting in 1974, the U.S. Air Force undertook several studies of the threat of a hostile attack by air, as well as Saudi Arabia’s ability to defend against such attacks. These studies led the Saudis to acquire later-model F–5s and more advanced aircraft—acquisitions that created the need to expand support facilities. In January 1975, the Air Force signed a memorandum of understanding that gave the Corps of Engineers a larger role in the Peace Hawk program — more responsibility for design and construction, including furnishings and equipment for all facilities required in the phase of the program designated Peace Hawk V. The estimated cost of these facilities, funded by the RSAF through FMS, was $480 million. In 1978, with only about a third of the F–5s delivered, the Saudi Arabian government reduced the number of F–5s on order, having succeeded, in spite of sharp opposition in the US Congress, in purchasing the more-advanced F–15, a project called Peace Sun. The first Peace Sun construction contract came in December 1979, and the work continued over the next five years. 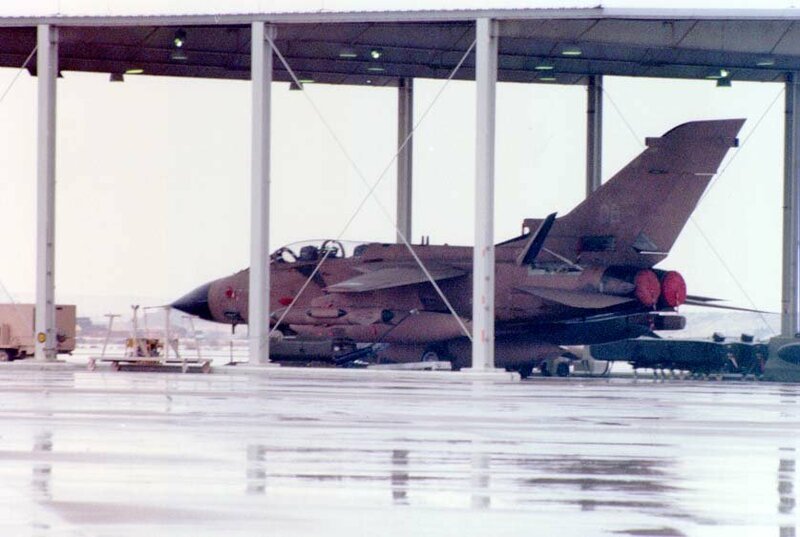 The program involved construction at Khamis Mushayt and Taif of aircraft shelters, avionics maintenance buildings, hangars, engine-repair facilities, flight-simulator buildings, squadron operations buildings, taxiways and parking aprons, roads, fencing, and staff housing. By January 1983, and the Royal Saudi Air Force had taken delivery of sixty F–15s and over one hundred F–5s. As of 1992, the Air Force still used three squadrons of later versions of the F-5 in the fighter-ground attack role, one squadron for reconnaissance, and a number of aircraft as advanced jet trainers. In 1984 first deliveries were taken of the more advanced F-15s. By 1992 the SAF had seventy-eight F-15s, including fighter conversion trainers. As a result of the Air Defense Feasibility Study accomplished by the USAF in 1980, a comprehensive security assistance package was formulated under the auspices of two separate but related Foreign Military Sales (FMS) programs. The expansion programs were structured so as to work towards eventual RSAF self-sufficiency in air defense, and were driven by the need to exercise sovereignty over, and to defend, an area comprised of over 2.3 million square kilometers of airspace and 7,000 kilometers of border -- an area essentially the size of the US east of the Mississippi River. The first program, known as PEACE SENTINEL, involved the purchase of E-3 AWACS and supporting tanker aircraft. The second, named PEACE SHIELD, dealt with a major modernization of the Saudi ground based command, control and communications system. The Boeing Company was selected to be the prime contractor on both programs. By 1987 U.S. decisions to block the sale of F-15s and Maverick antitank missiles to Saudi Arabia, among others, adversely affected the US economic and defense industry. As a result of the United States rebuff, Saudi Arabia turned to Britain to meet its requirements. BAE Systems has had ties to Saudi Arabia since 1966, when the company was contracted to Lightning and Strikemaster aircraft and equipment in a program called the ‘Magic Carpet’. In 1973 the Company’s activities were incorporated with a Memorandum of Understanding between the Saudi and British governments. BAE Systems, then the British Aircraft Corporation, was appointed the Prime Contractor. In 1985, a new government-to-government agreement was signed covering supply and support of Tornado, Hawk and PC-9 aircraft and, at a later date, minehunter ships. Again BAE Systems was appointed prime contractor, working in close co-operation with the Royal Saudi Air Force and Royal Saudi Naval Forces. By meeting its commitments, the Company has helped preserve the long-term security of the country and its people. In mid-1988, it was announced that as part of a huge transaction, Saudi Arabia would acquire Tornado fighters from Britain in their strike and air defense configurations, plus Hawk jet trainers and Pilatus PC-9 trainers built in Switzerland and outfitted in Britain. Project Al Yamamah is Britain's largest export contract assisting the Royal Saudi Air Force to become self sufficient. As of early 1992, three of the RSAF fighter-ground attack squadrons were equipped with Tornadoes and three squadrons were equipped with F-5Es. Two air defense squadrons were equipped with Tornadoes and three squadrons were equipped with F-15Cs. The three transport squadrons were equipped with C-130s in various versions and CASA C-212s, a medium transport of Spanish design. The two helicopter squadrons employed a variety of smaller rotary-wing aircraft. As of 1992, the first line combat air strength of the Royal Saudi Air Force (RSAF) consisted of some 200 aircraft, organized into six fighter/ground-attack squadrons and five fighter-air defense squadrons. The personnel strength of the air force was estimated to be about 18,000. Although modest in comparison to the air power of neighboring countries, the RSAF was considered to be the most modern and effective of the Saudi services. Its mission was to defend the economic installations and the widely scattered population centers of Saudi Arabia against attack and, particularly, to repel air attacks or amphibious assaults against the country's highly vulnerable oil pumping stations, processing and loading facilities, and oil platforms in the Persian Gulf. The first-line combat fighters were deployed at four key airfields: Dhahran, to defend the main oil facilities of the Persian Gulf; At Taif, covering the ports and holy cities of the lower Red Sea; Khamis Mushayt, defending the Yemeni border zone; and Tabuk, to defend the key ports of the upper Red Sea area and Saudi air space adjacent to Jordan, Syria, and Israel. These four bases and the air base at Riyadh were protected from air attack by Improved Hawk (I-Hawk) SAMs, hardened aircraft shelters, and underground command posts. Although the Saudi Air Force still had over 350 combat aircraft, some operational capabilities declined during the 1990s' with the F-5EIIs and other F-5s losing substantial operational capability. By 2006 Saudi Arabia had at least 15 active military airfields. The air force was organized in seven fighter/ground-attack squadrons, six fighter squadrons, and seven training squadrons. Saudi Arabia ranked among the world’s most densely armed nations, and it had ambitious plans to further upgrade its arsenal. The upgrade of the RSAF Tornado fleet under the Tornado Sustainment Program performed ahead of schedule. A total of 61 of the contracted 81 aircraft had been delivered back into the fleet at 31 December 2011. The delivery of weapons capability under the program, including associated storage facilities, was performing in line with expectations.